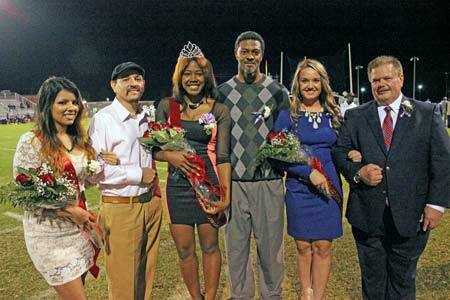 Strom Thurmond High’s 2013 Homecoming Queen was crowned Friday evening at half time. She is Shayy Widner. She stands (center) with the first runner-up (left) Yahaira Escalera and second runner-up, Megan Sherman (right). They are pictured here with their fathers. Photo by Bill Hart for The Advertiser.